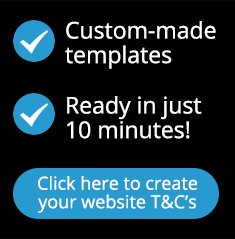 Using our super fast document Generator / Wizard, answer a simple set of questions and our E-terms system will generate custom documents unique to your business, all in under 10 minutes. Your documents are NOT 'off the shelf' Templates that you need to mess around manually editing. Our system creates a full set of documents tailored to your business which you simply download. They are fully formatted so can be directly copied and pasted into your Website. Our website documents are compliant with EU and UK regulations including The Distance Selling Regulations Act 2000, Electronic Commerce Regulations, the Privacy and Electronic Communications Regulations, EU Cookie Law and GDPR. All our services are based on a master set of T&C's drafted and reviewed quarterly by our lawyers. All e-Terms packages have been updated to take account of GDPR. Also included are notes and general guidance which aims to help guide you through the processes/business practices that you may need to adopt in order to comply with this new legislation. 4 - Fast & Tailored to your business! You don't have to spend time editing off the shelf documents, just enter your details and answer some simple questions and we instantly build you a unique set of documents that match your business requirements. Everyone knows that lawyers are expensive. By using our automated service we can save you hundreds of pounds. Don't waste hours trawling through legal documents such as the EU distance selling regulations, just follow our interactive system to produce a set of tailored E- terms and conditions in minutes. 7 - Up to 12 months access to our system! Our eCommerce package customers have access to our system for a full year from the date-of-purchase, this allows you to edit, update and download revised legal documents. This enables you to correct any mistakes in your original Ecommerce Terms and Conditions, or test out different ecommerce scenarios. It's also a great solution for new start-ups requiring Ecommerce Website Terms and Conditions for a merchant account application, but not yet up and running with the new website. Also please see 'Laws Change' below for future proofing! If for any reason you're not happy with our service, please contact us and we'll do all we can to help. If you receive advice in writing from a solicitor that our terms are not suitable for your business, with reasons given, and you forward that to us, then we will issue you a full refund. We recognise that the law and interpretation of the law changes on a regular basis. We ask our Internet lawyers to review the master templates on a regular basis to make sure we can provide you with the best protection for your website. To ensure compliance with Trading Standard guidelines, we also try to keep our Terms and Conditions easy to read. Our solicitors said, "It has to be recognised that complicated Terms and Conditions achieve only confusion, and as more and more buyers check the Website Terms and Conditions before ordering, we need to focus on making them easier to understand.". If you want a merchant account to accept credit cards via your website, the bank will ask for a copy of your ecommerce terms and conditions.